Jessying - Malaysia Beauty Blog - Skin Care reviews, Make Up reviews and latest beauty news in town! : Acca Kappa & MAC Party Inspired by the Spirit and Fantasy of Wonder Woman! 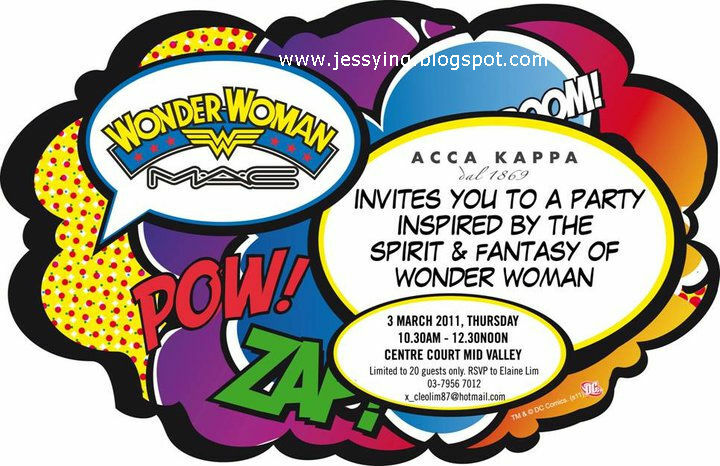 Acca Kappa & MAC Party Inspired by the Spirit and Fantasy of Wonder Woman! RSVP for an exclusive make-up party treat from Acca Kappa & MAC! This party is Inspired by the Spirit and Fantasy of Wonder Woman! 1 invites entitles to 2 more friends that you can bring along ! so how was the party? Did they give any sample of makeup products?